The character of Ellery Queen is the product of the imaginations of two mystery writers who sign themselves "Ellery Queen." 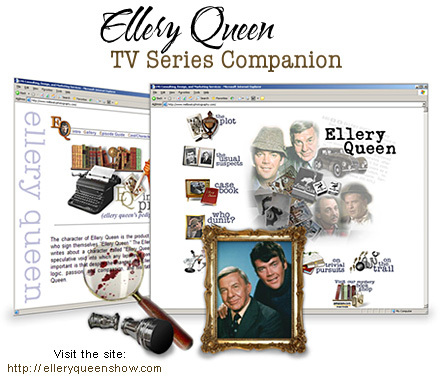 The Ellery of the books is also a mystery writer who writes about a character called "Ellery Queen." That sort of infinite regress leads to a speculative void into which any lapses of continuity in the saga can easily fit. What is important is that despite the changes, the Ellery we read about is always Ellery, filled with logic, passion, and compassion, and his father is always the same Inspector Richard Queen. In 1975, Universal City Studios and NBC Television brought this icon of the mystery genre to network television in a 1-hour format weekly series. We consider the Jim Hutton characterization to be the most engaging, charming, and classic of all attempts to capture Ellery Queen for the screen (large or small). He is a perpetual fountain of profound deduction, displaying a sparkling wit and whimsical ingenuity that sets the most serious watcher's fancy dancing with delight. Such is the case with this marvelous series, which — set in the 1940's — enhances each scene with period piece perfection. Add to this the dynamic of father and son, so perfectly matched as Hutton with veteran actor, David Wayne, and the Queens reach true royalty status. Copyright © 1998 – 2008 LNS Design and Marketing. All Rights Reserved.